The Sunshine Coast Daily reported that Dean Middlebrook pleaded guilty to more than a dozen domestic violence charges including punching, kicking, choking her with water from a hose, breaching AVOs. 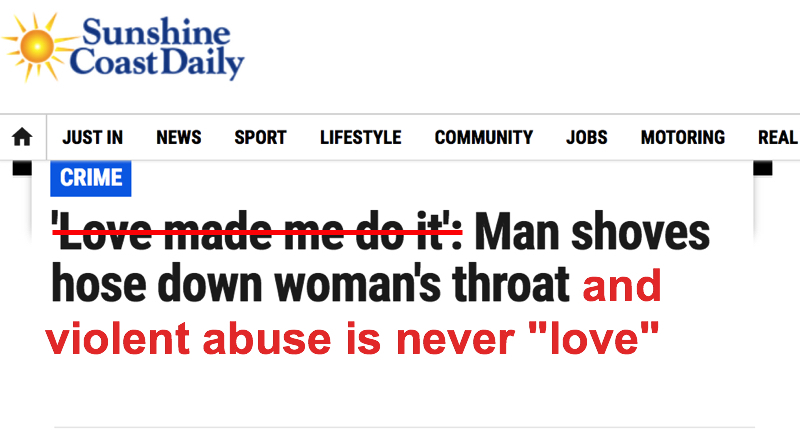 Middlebrook might be claiming that love made him do it but that doesn’t mean the court or the media has to accept and perpetuate the excuses a violent offender made for his choice to be violent. Love does not make anyone violent. It is not an excuse or a justification for violence. Only one thing causes violence and that is the perpetrators choice to be violent.